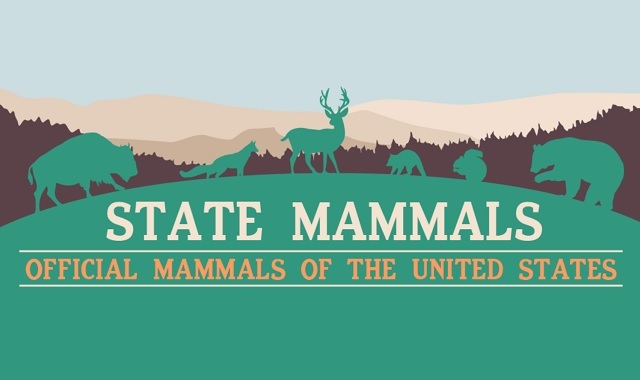 50 State Mammals of the United States #infographic ~ Visualistan '+g+"
The United States has over 766 million acres of forest land filled with a variety of species of animals; some aquatic, some feathered, and in this case, some warm blooded. As we humans are also in the mammal category, we seem to have grown a strong bond with our fellow warm-blooded friends. These strong bonds and admiration for some of the largest mammals on Earth have lead to this infographic, the Official Mammals of the United States. Some of the states have had several official mammals throughout their history, but this represents the first ones to ever be declared. Weave your way through state favorites that span a wide variety of mammals, from the giant bowhead whale which was deemed Alaska’s mammal to Kentucky’s little mascot, the gray squirrel. You won’t be surprised to see man’s best friend repeatedly appearing, as various breeds were chosen to represent SIX different states!